“Garretson is a second-year student majoring in economics. He became interested in the liberal arts through his high-school experience and by having the opportunity to observe influential leaders like U.S. Senator Sherrod Brown and former-Cincinnati Mayor Roxanne Qualls. Through his time in student government, Garretson has focused on developing his own collaborative leadership style by bringing people around the table and hashing out solutions. “Leadership Rooted in the Liberal Arts” represents a collection of his ideas for building consensus and becoming better leaders in the classroom, workplace, or extracurricular environment. 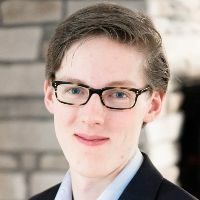 You can also hear more from him on Roundtable, a discussion show on WRUW-FM 91.1 Cleveland on Wednesday evenings at 7:30 p.m.” Garretson is giving a talk titled “Leadership Rooted in the Liberal Arts”.